Pennsylvania governor race: Republicans support Tom Corbett by linking Democratic challenger Tom Wolf to Kermit Gosnell. Pennsylvania Republicans hope to boost Gov. 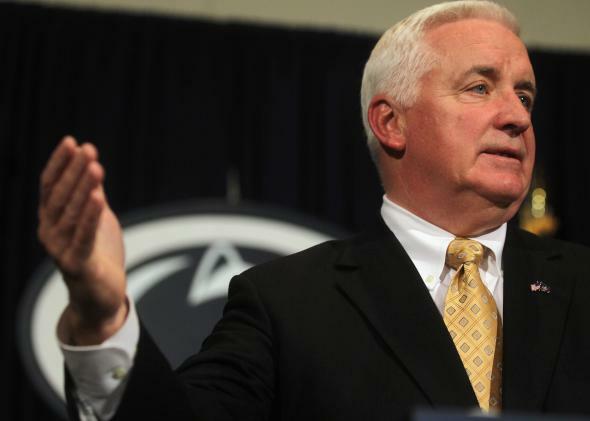 Tom Corbett by linking his challenger to an illegal abortionist. I have no problem with hard-hitting political ads, as long as they’re based in truth. But this flier—which Corbett’s campaign says was produced by the state Republican Party and which Pennsylvania radio and TV commentator Michael Smerconish posted to Twitter on Monday—implies that Wolf supports policies that would allow another Kermit Gosnell to flourish. There’s no reason to believe that. Gosnell was a doctor who was performing illegal abortions—and actually killing babies—in a filthy Pennsylvania clinic and who managed to go undetected for years because the state regulatory agencies ignored repeated complaints about him. His clinic was eventually raided on a warrant related to his role in distributing illegal drugs, and he was eventually found guilty of three counts of first-degree murder and one count of involuntary manslaughter. Wolf is pro-choice and has spoken out specifically against “backward legislation signed into law by Governor Corbett that restricts a woman’s right to make her own personal health care decisions.” Corbett did sign a law requiring abortion clinics to meet the same standards for ambulatory surgical centers, even though there is no medical reason to believe these standards make clinics safer. More importantly, there is no reason to think that Corbett’s law had any role to play in preventing future Gosnells from operating. The problem in Pennsylvania wasn’t a lack of restrictions on abortion providers; it was that the restrictions that already existed weren’t being enforced. And there’s no particular reason to lay that problem at the feet of Democrats, as Gosnell was finally arrested in 2010, while Democratic Gov. Ed Rendell was still in office. Nor does the Gosnell case actually suggest that abortion clinics need to be subject to a more stringent set of regulations than other clinics doing similar procedures like colonoscopies. Any doctor who runs a clinic as filthy and poorly staffed as Gosnell’s should be shut down. Any doctor selling prescription drugs illegally is breaking the law. Oh yeah, and any doctor—and person, actually—who kills babies would be convicted of murder. No extra regulations necessary. The only abortion-specific law of which Gosnell was found guilty was not forcing women to wait 24 hours for an abortion, and it strains all credulity to think that’s the law that’s going to stop future immoral doctors from running shoddy clinics that prey on poor people. Gosnell’s case demonstrated the need for health regulatory agencies to do their job. Corbett—whose party tends to look more askance on government regulations than Wolf’s does—has not made a convincing argument that he’ll do a better job than Wolf in enforcing the regulations that already exist. Until then, his supporters look like they’re more interested in frightening Pennsylvania women than in actually securing them health care.